Looks like my girl Alisa Clickenger is at it again. I can't wait to join their team to help make this happen in 2020. 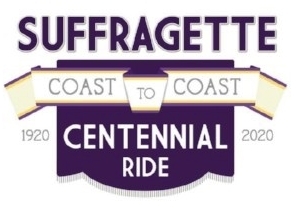 A ride celebrating the power, freedom and unity of American women on the centennial of the right to vote. Progress is measured in big and small ways every day. A formative step towards the equality of Women in America was the passage of the 19th amendment of the US constitution allowing American women equal vote in fair and free elections. Progress continues on to this day and will be celebrated in August of 2020 with the Suffragettes Centennial Motorcycle Ride. This cross-country ride is dedicated to all women who have fought for equality in the voting booth, in business and in life. The Suffragettes Centennial Motorcycle Ride 2020 (SCMR2020) is a female-centric multi-route cross-country motorcycle ride. The primary routes depart from the West Coast and arrive in Washington, D.C. approximately three weeks later. Major cities across the country will be announced as starting points for rides that will join into a single large group as they roll towards Washington, D.C. The ride will benefit several charities that service female interests across the US, and will be broadly shared via social media and editorial coverage. Riders will have the option of registering for a nearly all-inclusive three-week tour, with other options for shorter rides. Each ride will feature unique points of interest, historic locations and will wrap itself in the majestic scenery of the United States. SCMR2020 is being announced early to inspire women to brush up on riding skills, learn how to ride and to set a goal to join what will surely be a legendary group making a powerful statement. Those wanting the latest information on SCMR2020 can sign up for a mailing list at http://eepurl.com/c-_Viz . Updates will be sent regularly in the coming months. There will be limited entries into the three-week Full Ride Tour program, with other shorter ride options as well. Registration will start in 2018. SCMR2020 is open to sponsorships and activation opportunities, and we’ll be tailoring each ride to create the most compelling experience possible for the participants. Interested organizations and companies can connect with the SCMR2020 team at Info@CentennialRide.com. A complete website inclusive of the general route, inspiring stories of female riders, resource listings such as riding schools, female-friendly motorcycle media, apparel guides and more is being developed and will launch in the coming months. The Suffragettes Centennial Motorcycle Ride is presented by Women's Motorcycle Tours, a Limited Liability Company. We recommend that all riders join the American Motorcyclist Association and enjoy the benefits of membership. SCMR 2020 media and sponsorship inquiries can be directed to Info@CentennialRide.com.